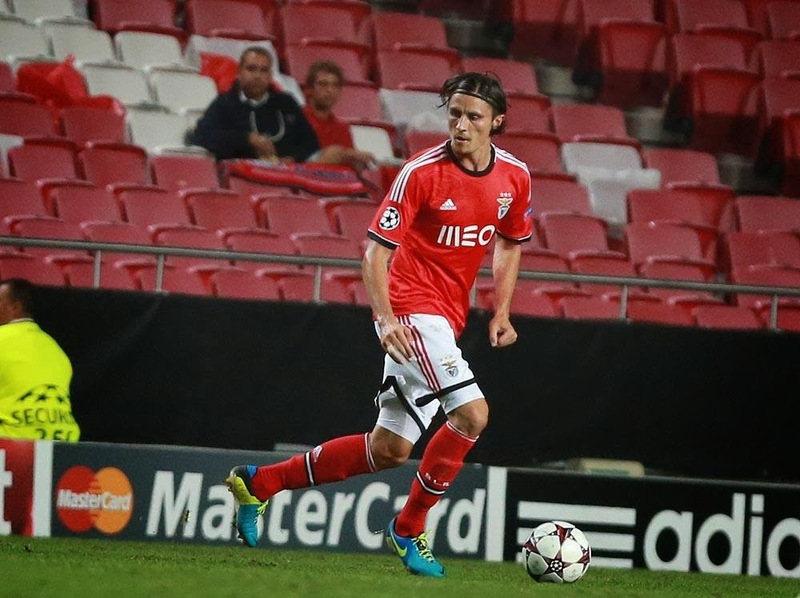 Football In Deep Thought: Is Fejsa the missing piece of the Benfica puzzle? Transfers are an odd thing. Spend a huge amount of money on a player and expectation tracks them like a spotlight on a stage. Spend a small amount – and sometimes getting fans to notice you at all is half the charm. This past week, Benfica played Anderlecht in their first group stage match of this season’s Champions League campaign. The lineup, deeply affected by the injuries to first choice players Nico Gaitán and Eduardo Salvio, was adapted accordingly to allow for the presence of new signings Markovic and Djuricic, but one name in particular was new to the starting lineup. Benfica’s new defensive midfielder, Serbian Ljubomir Fejsa made his 2nd appearance for the club since signing from Olympiacos in the summer. After the match, the unassuming Serbian was arguably Benfica’s most important player on the pitch. Fejsa’s performance wasn’t spectacular, but was (crucially) tactically valuable… and it gave some indications that by luck or plan, Benfica may have very quietly signed a very important piece of their title-challenging puzzle. Last season provided several examples of Benfica’s vulnerability on the counter attack, and much of it resulted from a lack of defensive cover offered by the shape of the team. Nemanja Matic, a natural central midfielder (as opposed to a defensive midfielder) was often asked to play both protector of the back 2 as well as a key part of the build up play into the opposition area, and this often left the Serbian with too much ground to cover to defend against counter attacks. Benfica’s vulnerable high defensive line would often leave gaps not only in behind Luisão and Garay, but also down the flanks (highlighted in yellow circles) due to the attacking endeavours of Maxi and Melgarejo. The introduction of a proper defensive midfielder, however, immediately changes things for Benfica. Fejsa showed tactical discipline against Anderlecht to ensure he protected the channel (as highlighted by the movement arrows and the yellow rectangle) in front of the centre back line. He didn’t do it alone, obviously – Matic also played this role on the left of centre. The team’s general shape against Anderlecht did illustrate however, the value Fejsa adds in offering proper protection against counter attacks and the attacking movements of the fullbacks. The team’s shape ultimately ended up more of a 4231 – with the double pivot of Fejsa and Matic working well to offer defensive cover and attacking support. The question is of course, whether or not the tactical theory was proven by the actual performance of the team and Fejsa’s contribution to the game against Anderlecht. Benfica lined up against the Belgian side in a loose 433 formation, with Fejsa largely staying just right of centre throughout the match in the middle of the pitch for most of the match. While Fejsa wasn’t directly instrumental in the 2 goals scored by Djuricic and Luisão, his impact on the game defensively was obvious. Fejsa’s defensive contribution was crucial to the Eagles, recovering the ball 6 times (out of 37). The Serbian also contributed a quarter of the team’s interceptions (4) and tackles (7), including 2 crucially in the box. Much of his defensive activity was down the right, to compensate for the movement of André Almeida and Enzo Pérez into forward positions to join the attack, or to assist Almeida with Anderlecht attacks down the flank. Consider that in the absence of a Fejsa, one (or both) of 2 scenarios is likely – more successful counter attacks against exposed centre-backs, and / or an overworked Matic would have needed to make up the ground to cover the gaps. Instead, Fejsa offered greater protection and the tactical discipline to make sure he protected the space in behind whoever was attacking down the right, minimizing the all too familiar risk of Benfica being caught on the counter attack. That’s not to suggest Fejsa concentrated his positioning only in the central / right midfield. He was responsible for a tenth of Benfica’s passes on the night (31 out of 317) and he managed to vary his positioning wherever the play required him to be. What is also interesting about his passing are the recipients. Fejsa’s passing distribution implied a comfort with allowing play to build up from the back via the flanks, something which Benfica needs to be doing more of (particularly in terms of controlling games with possession). The most frequent recipient of Fejsa’s passes was Siqueira (6), while Luisão, Matic, Almeida, Ola John and Markovic all received 2 passes each. The effect Fejsa’s presence had on Nemanja Matic was pivotal. There’s a school of thought that Benfica’s best player of last season shouldn’t be playing as the defensive midfielder and his passing talents in particular would be better employed in the build-up towards goal further up the pitch. The passing chart suggests that Matic still operated in a box to box manner, but for once, he didn’t have to operate across the entire pitch. He was able to cover more effectively for Siqueira’s moves down the left flank and link up more often in the attacking 3rd, as can be seen by his passing distribution. Matic also spent more time providing the attacking play, with passes to Siqueira (10), Markovic (6), Djuricic and Ola John (5 each). Granted, one shouldn’t read too much into the Anderlecht match. It’s one fixture, against a weaker side. However, there’s certainly a case for Fejsa offering Benfica a whole new set of options in tactical versatility. The most important aspect he offers is the ability to protect the centre back line more effectively, but there are many other benefits as well. Matic and Enzo can now push forward with less concern of the protection needed behind them. Given their ability to press, it gives Benfica further opportunity to regain possession closer to the opponent’s goal, offering additional advantages for Benfica to dominate games. It also offers a proper double pivot in midfield. The merits of a proper 3 man midfield have also been debated by several Benfiquistas, especially given Porto’s successful application of such a system in recent years. Last season’s loss of Javi Garcia and Axel Witsel limited Benfica’s options in being able to leverage players in a 3 man midfield. Now, not only does Fejsa give that opportunity, but Benfica can use a proper double pivot to good effect in the manner that both Fejsa and Matic went about their business against Anderlecht. Probably the most enticing aspect of Fejsa’s inclusion is the fact that he brings stability to the midfield to the extent that it offers the freedom to experiment, without fear of unbalancing the team’s defensive shape, with the configuration in the attacking 3rd. Benfica could easily line up in a 433, 4231, or 442 Diamond formation and rotate the talents of Markovic and Djuricic especially, while still maintaining a core midfield duo of Fejsa and Matic. So in conclusion – a good start to Fejsa’s Benfica career, and some genuine reason to be positive about the contribution he could make to the team’s success. Here’s hoping the master-stroke that brought the Serbian to the club is leveraged properly by Jorge Jesus… because if it is, Benfica may no longer be just a collective of talented individuals. They may also end up with a midfield that not only rivals Porto – but surpasses them. Get that right and Benfica may just yet become the cohesive unit - the true team - that they have the potential to be. Who said Fejsa was signed on a small amount? Fejsa transfer cost Benfica €5M. I'm not aware of Benfica transfer budget but €5M is not a small amount by any means.